Truer words never spoken. 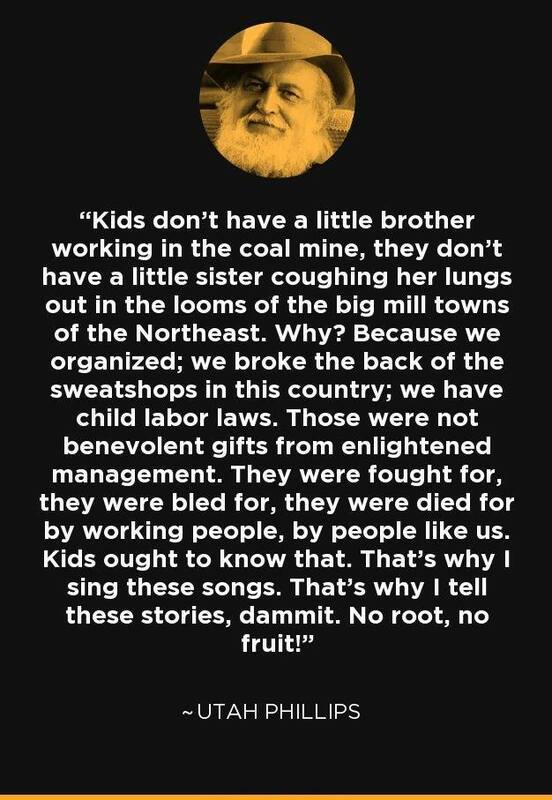 We don't have children working in coal mines and factories around here. But it doesn't have to stay that way. 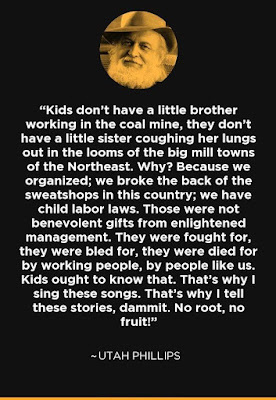 We've heard GOP pols like Newt Gingrich trash child labor laws, saying that kids ought to go to work cleaning their schools. If you think Newt is worried about your children or mine, I have a bridge to sell you. Sure, Newt just wants the kids to clean up a little in school. And sure, the Supreme Court will just free up Americans to not pay union dues. No big deal, right? Well, not really. It's a slippery slope with child labor. Pretty soon you'll be right back to where Utah Phillips said we used to be. And make no mistake, Donald Trump's Supreme Court is not worried about how much extra change is in the pockets of working people. Withholding union dues while living with union privilege is shirking responsibility. It's selfish, it's undemocratic, and it's an essential revolt against community. I regularly wonder what I will do as chapter leader with people who opt not to pay union dues. One UFT official told me we would still have to represent everyone. I am honestly not sure how I will do that. I can tell you I will have little or no respect for anyone who thinks they should be carried on the rest of our backs. I have options, though. I remember a chapter leader I once had, and how he used to handle things. Whenever you would approach him, he would listen and say, "Put a letter in my box." Once, he confided in me that 80% of the people to whom he said that didn't follow through. It didn't make a whole lot of difference, though. If you tell me to put a letter in your box, I'll put a letter in your box. To the best of my recollection, he gave the same attention to you whether you put a letter in his box or not. I never tell people to do that. I have an email I use for school UFT activities, and I am very good about getting back to people. Some problems are easy, especially after I've seen them repeatedly. Sometimes I look up answers at UFT.org, copy and paste, and people think I'm a genius. I also have a whole network of people who will help me with questions, some of whom work for UFT and some of whom don't. Sometimes I copy my district rep. if I think he can help. So I'm wondering what I do with non-dues payers. Should I treat them like everyone else, and hope they come to their senses? In our school, we have a Sunshine Fund. My least favorite activity, as chapter leader, is collecting for it. I generally assign committee members to help and sometimes play cleanup. But people who don't pay don't pay. It really doesn't matter if I win grievances for them. I'd be surprised if these people paid union dues, but I'd respect them a lot more if they did. But what if they don't? Is it put a letter in my box time? Should I devote my energy into teaching them the virtue and meaning of union? Will I be able to make that $1300 speech? Would you?